Look great. Stay warm. Beanie is 95/5 poly/spandex fleece blend to retain shape. Scarf is 100% polyester R-tek fleece. Emroidered Black Paw Newf on both. Also sold separately. 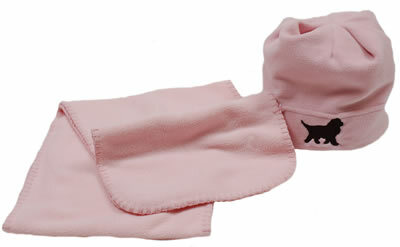 Our fleece beanies/scarves/headbands are warm, soft and have an anti-pilling finish for lasting wear. Available in Pink, Red, Purple or Midnight Heather.